Emerald Pointe is a gated active adult 55+ community situated in Delray Beach off Hagen Ranch Road, Florida. Emerald Pointe offers 300 residences that offer its residents with modern and popular amenities that are specially designed for active adult lifestyle. Residents in Emerald Pointe enjoy the availability of activities designed and low maintenance of the properties specially designed for active adults. 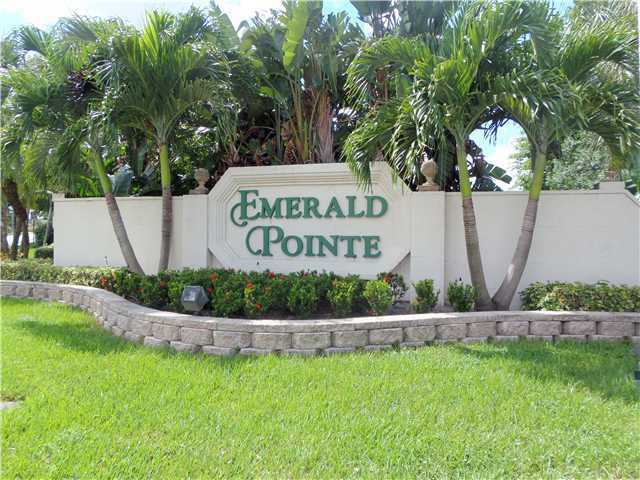 Emerald Pointe is conveniently located with easy access to major highways, top-notch shopping venues, high-end restaurants, entertainment and everything Delray Beach has to offer. Search all homes for sale, just like an agent. Our free, one step registration allows you to bookmark your favorite houses, save search and receive emails as soon as new homes in Emerald Pointe come on the market. Emerald Pointe Real Estate is comprised of 300 elegantly designed for active adults with low maintenance exteriors as well as Mediterranean-tile roofs. Emerald Pointe homes offer impressive amenities and features including vaulted ceilings, eat-in kitchens, oversized showers, spacious master suites, and much more. Emerald Pointe offers both condos and attached Villa for potential homeowners. Condo units in Emerald Pointe are located in 2-story building featuring living square footage between 1,400 and 2,000 sq feet with at least 2 bedrooms, 2 bathrooms, and 2-car garage. Villa in Emerald Pointe offers 2-3 bedrooms, 2-3.5 bathrooms, and 1-2 car garage with living square footage ranging from 1,450 to 2100, sq feet. Emerald Pointe has a resort style lifestyle and amenities including a clubhouse that offers social and physical activities, recreational spaces such as a game room, billiards table, card room, banquet hall for live entertainment, swimming pool, tennis courts and more. Residents at Emerald Pointe enjoy a vast array of cultural events, and proximity to Downtown Delray top-notch restaurants and high-end shopping venues. Nearby Emerald Pointe are over 150 golf courses where golf enthusiasts at Emerald Pointe can stay on top of their game. In addition, Emerald Pointe residents can also enjoy sports fishing and miles of pristine beaches that are close by.